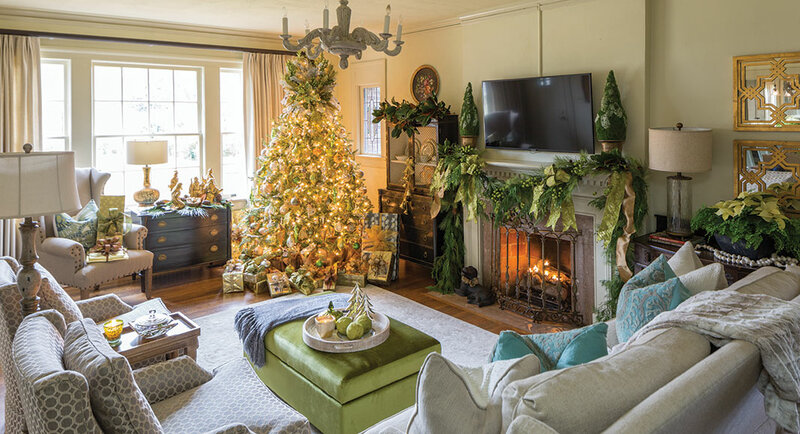 When it comes to decorating her 1936 Tudor-style home for Christmas, Ellen Gaberlavage lets the house speak for itself. “I just stand back and visualize what I want,” she says. 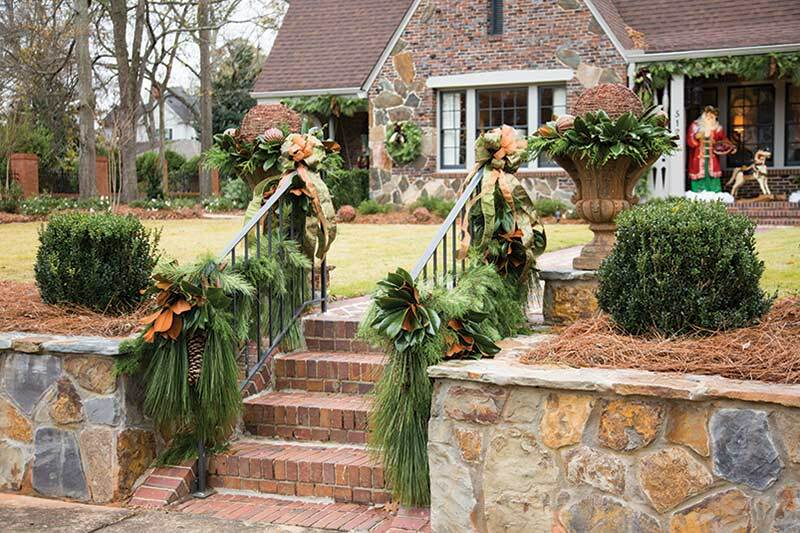 “This year, when I stood back and looked at the house, I could just see pine.” Her vision resulted in an exterior draped in pine garland dripping with oversize pine cones. Framing the porches and tucked into window boxes, the greenery complements the warm brick and rough-hewn stone of the home’s exterior with rich, rustic style. 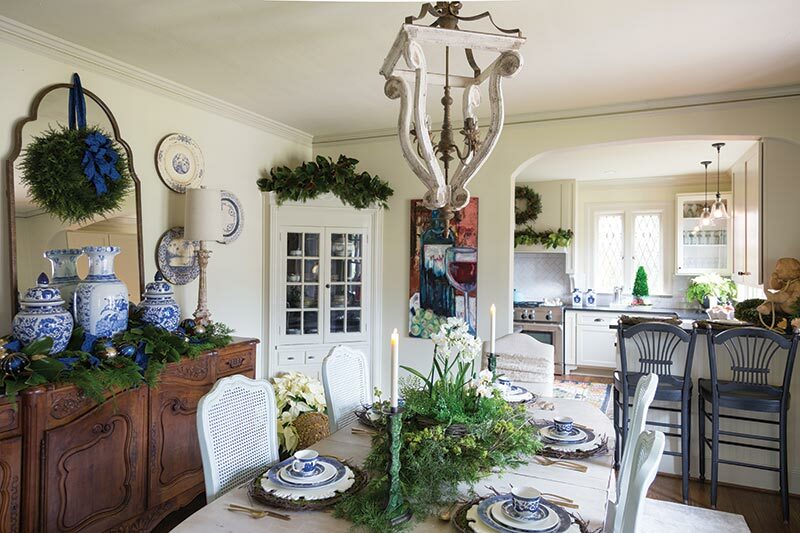 It’s a style that demonstrates Ellen’s passion for holiday décor, which she carries throughout her entire home. “I probably have hundreds of thousands of decorations,” she says with a laugh. 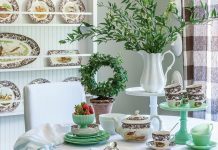 “I change everything up from year to year.”This year, in order to execute her vision, Ellen hired holiday décor designer Tracie Davis Allen, who enlisted the help of Emile Earles, owner of the Sweet Georgia Brown antique store. 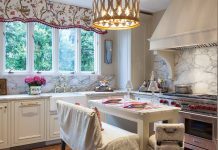 Throughout the home, the light, fairy tale-esque theme inspired by the china room is complemented by touches of antique character. A dark wooden hutch in the family room houses more of Ellen’s collection, covered in a soft glow from the regal tree that resides in the corner. Foil-wrapped gifts reflect the warm light, calling out the fresh green tones throughout the room and setting the scene for family gatherings.